After being underwhelmed by the first book in this series I wasn’t exactly excited to read this successor. However as I’d bought it on special before reading the first I figured I’d at least have a go. It is the second of what I assume is (or will be) four seasonal outings and takes place in a sweltering Swedish summer in Linköping. I know it’s not what most people first think of when imagining Scandinavian crime but Kallentoft has nailed the setting element of this novel. Long, oppressively hot summers is a subject I know a little something about and I thought the depiction was pitch-perfect. That kind of heat does take on an almost physical presence as though having actual weight, people do talk about it constantly and everyone has their idiosyncratic strategies for dealing with it. When bushfires are added to the mix, as happens here, they do cast a psychological as well as physical haze over the population as described in SUMMERTIME DEATH. For me though the rest of the book is less successful. The story meanders needlessly and wordily and is subject to more silliness and awkward plot devices than my willingness to suspend disbelief allows. There are too many forgotten tasks that no real police would actually neglect to do, too much random guesswork about potential suspects (most of which are based on some pretty spurious stereotypes) and the ending in particular is the result of a series of actions that I simply didn’t believe (though it’s impossible to discuss why without giving away too much of the plot). The fact that the entire thing is overseen by a pair of chatty ghosts is an additional negative for me, though if the amount of novels in all genres with this theme is anything to judge by it seems I am in a minority of readers not enticed by the current obsession with things paranormal. Malin is really the only character to be well fleshed out and it is a decent characterisation though it would, in my opinion, have benefited from some tighter editing and less repetition. Every little while Malin is either drooling over the idea of a glass of tequila, obsessing about her absent parents’ dead pot plants or wondering what went wrong with her marriage. These details help build up a picture of Malin which contrasts with her more public image as a woman in control of things and so are valuable but I’m not convinced they need to be repeated quite so often. The combination of lots of little niggling annoyances and a growing paranormal element will, I think, mean I’ll read no more of this series. It’s not so much that it’s terrible, merely that I can think of dozens of new authors I haven’t tried yet and old favourites whose work I am behind on so I don’t really need another ‘OK’ author in my reading list. 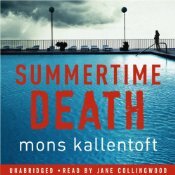 I did enjoy the narration of the audio book by Jane Collingwood (I so adore having the Swedish names pronounced properly for me) but ghosts with breathy teenage girl voices are even more annoying than ghosts in italics. This entry was posted in book review, Mons Kallentoft, Sweden. Bookmark the permalink. Bernadette – I agree with you about Malin. I find her character developed and rounded if I can use that word. And like you, I’m not much of a one for the paranormal unless it’s handled extraordinarily well. I think the part of your review that resonated the most with me was taking the time to read an OK book when there is so much excellent work out there. And so much that hasn’t been discovered (i.e. I’m not sure if it’s excellent ’cause I haven’t had the time to try it yet!). I’m having to look at my own reading habits and make some choices myself, and although I’d love to read it all, I can’t. And I suppose that’ll mean I’ll probably be reading fewer ‘OK’ books too. I think I’ll skip this one. I have so much on my TBR lists and piles that to not have to add another book is a relief. And, I, too, avoid the paranormal, if possible. The only book I thought a ghost appropriate was Asa Larsson’s Until Thy Wrath Be Past. Brnadette, I read Autumn Killing [book 2 or 3 in this series] and wasn’t very impressed by the style, the flimsy plot, and the pathetic moaning of the main character Malin Fors. Mons Kallentoft seems to have the idea that rapidly switching perspectives between characters and adding ghosts makes your book literature. I agree that Asa Larsson did paranormal beautifully in what was an integral part of the plot in Until Thy Wrath Be Past. Thanks for a great review. I have yet to read my first Mons Kallentoft book. It is on my TBR pile. I won’t be rushing into buying this one, just yet. I don’t get the obsession with the paranormal either. Surreal is fine, but paranormal just reminds me of my kid’s Goosebumps books!!! He’s a writer that divides opinion. I’ve enjoyed all 3 books so far and I’m looking forward to the fourth as there is an unresolved plot strand which if it isn’t resolved by book 4, I shall be cross. #i don’t like it either when you hear the dead person’s voice. I didn’t even like it in the Larsson I’m afraid. I would never think of sweltering summers in Sweden. Thanks for the review of this one. I don’t like books where paranormal is thrown in. There’s is enough intriguing in this world without dragging in something from the next. I couldn’t agree more Ann – this world is crazy enough for me to be going on with. It’s too bad the book didn’t live up to the basic premise, which sounds quite intriguing. I really don’t like it when the police in crime novels (or a private investigator, for that matter) forget to take what would be basic, routine steps in an investigation. In one book I recently read, the protagonist was kidnapped but got away – with the bad guy’s cell phone in his pocket. He goes to the police, discusses with them what can be done, is told the trail is cold so he leaves. And the whole time this is going on, I’m nearly screaming, “The cell phone! The cell phone in your pocket! Surely …!” but of course, to no avail. That phone just kind of disappeared from the story altogether. I still wish the author could have heard me when he was writing the book (now, THAT would be a paranormal touch indeed!). LOL Belle – I love that image of you mentally screaming at the author – I’m sure we’ve all done that at some stage. It is highly annoying when it happens though.